I take the glowing path. Is the visible concrete for interpretative design? Infinite mountain waves. A point in the foreground, a point in the background. Minke whale flanked by ice chunks, shards. Cold sun. Wind currents open side-scrolling topographical renditions of unseen elevation. Numerical code directs travelers to an easily traversable mountain path. Seal-eating seal. Views of water, ice, penguins, trees, condors. A micro-cluster of changing climates. I place items in my bag to carry with me. In a state of confusion, is site interchangeable with sight? Mountainous obscurity strengthens when zoomed out. Numerical distance repeats, anchors, stretches. Speckling land signals hairline indents. Places where, to move forward, a visitor leans into their steps until index finger touches land to balance and propel. If these movements fail, a progression backwards excels until the former propelled is now lower-level sediment. I hike into the hand-colored territory further. If the trees are in zero visibility, is this the reason the path is changing? A precipice copy, a neutral element, is a track for immersive viewing. A place to return in the gaps of artificial sight: to settle, to rest, to transfigure the intonations of light into traversable, three-dimensional landscapes. Milk like oil on water. Landmasses uncoil. A valley in an instant at the base of the mountain. I rest on a rock to eat a biscuit and drink coffee. Is assigning a letter to a point on a map an act of geographical preservation if the plotted zone shifts its topographical identity? Preserve changing iterations to smash numerically designated time. Time is most prevalent in landscape. You must attain communion with nature to time travel. Cellular networks unravel, like constellations, to reveal time-specific sites. Chance is rectified by internal coordinates. Mountain region, plains region. Conglomerates of other time. I watch glaciers lurch into the ocean from the mountain. If climate sustains consistent attributes in quartered geography, is it a signal of a preserved fluctuation in deviations spawned from isolated time decay? New internally navigated concourses await the traveler. Alien fruit: beach strawberry. Ice in the forest in August. Hummingbirds and dolphins. Captured light settles on a cold rock, somewhere lost in a forest or a beach. A shadow circles cold rock curvature, erasing its gravitational permanence. Going solar. Only around the edges, can you see it. I listen to moving and interrupted water. If constellations are unmapped, is the territory below unknown? Events, matter, nature, growth, forces unseen to the eye and untouched by the flesh end unnaturally or naturally. The unknown is elemental when the world unlatches below visuality in isolated segmentation. Cosmic, chaotic chance distorts lived spaces in interpretative design when erratically travelled. 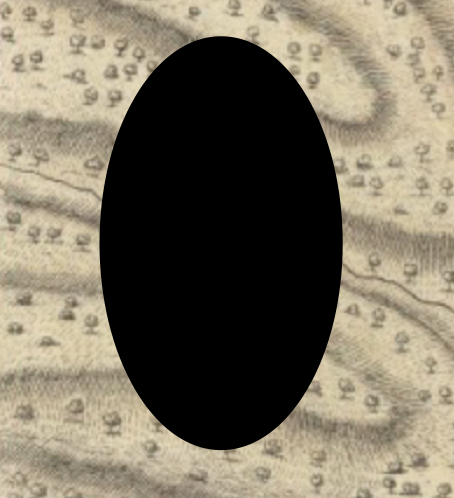 One signal to network: what is concrete to the cartographer when cartography is a null connection. What is unknown. I time sun-shifting shadows over sea-bound mountain ice. Is time a container of material changes if chance sequencing is core to routing individual constructs to stable matter? Aura of assembled sedimentary nugget is cast. Above, below. Water gel grips odd fruit-on-vine. Cold summer fruit wine poured into sand. In containment, land recursion is 1⁄2 parallel downward. An isolation of paired, stubbed peaks. When below the highest peak, look up at the naturally-formed edges. Erosion is a chemical reaction. Is not. Stems, or branches, in the trunk, at the base, are. I eat a caramel raspberry chew as night descends. If an unseen element glimmers seen in a glance, is its terrestrial break proof of its extraterrestrial existence? Open, certainty-shattering space dins behind walls. Fading lines surface dim impressions of past light onto land. A trajectory mapped on ghost surfaces redirects the traveler to supernatural pathways. Mushroom-lit stone path, a bioluminescent friendly greeting. You must accept uncertainty to time travel. Trees, mushrooms, stones in the corner of where the mountain touches space. I see unannounced visitors gloss opaque night. If a seaside mountain night is sprinkled with alien illumination, is the darkness in a compromised state changing into something else? In smoke, cloudy like a witch’s mirror. All nocturnal elements are changing in front of you—as you rest, as you read, as you sleep, as you walk. Assume all shadows harvest brightly-colored eons old intrusions. Physicality is a myth. You must shed physical constrictions to time travel. In nightside occupation, static sentinels guide you into the shift. I sip lavender, mugwort, skullcap, and damiana tea. If something else walks the mountain path at night, a thing beyond a plotted map, is that thing known or unknown; if it is strange, is it friend or foe? Nighttime is a portal. Oval-like, sundry with tricks, night arrives like a wrench. Night elevates perception, increasing focus on ocular flits as secrets pass unseen. A portal is like a brush. You comb fragile edges into its maw. Faint tree flowers nudge mountain winds. A parakeet’s song. Farming sheep. King penguins, guanacos. Sleeping at night. Ed Steck is a writer/artist living in Florida. Ugly Duckling Presse will publish his most recent work, An Interface for a Fractal Landscape, in February of 2019. 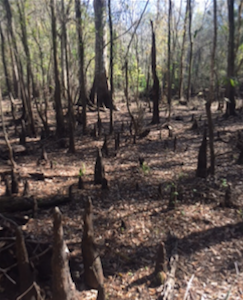 I enjoy walking along the river next to and between the cypress knee knobs. I encountered a lengthy alligator here. It nearly spanned the width of the river. A kayaker fled and warned to keep a safe distance. The swamp is peaceful.